… but didn’t know where to ask. Today, Craig Morris presents Fraunhofer ISE’s update of its annual “Recent facts about photovoltaics in Germany.” In addition to German specifics, the review covers a lot of general info about solar power. For instance, how can we spread solar power production across more hours without storage? Yet another source of information about the Dunkelflaute (times of low wind and solar power production)! Does PV (and wind) replace conventional coal and nuclear plants? “No, not in the near future,” writes solar researcher Harry Wirth in the 2017 update of the PDF (in English). Simply put, the sun doesn’t shine all the time. But storage options are coming, as is demand shifting – and power-to-heat will help solar power serve a greater share of total energy supply, as will the charging of electric vehicles and cross-continental storage as hydropower from Norway to Sweden. The study briefly sheds light on all these issues. We have been using Fraunhofer’s PV overview ourselves for a few years. Here, our chart from 2015 shows how the price of installed arrays have dropped over the year’s – and, with the help of data from Rocky Mountain Institute, we show how much cheaper German feed-in tariffs made PV relative to US prices. Originally launched in 2011, the paper covers the main questions asked about PV. Do solar roofs pose a fire hazard? Yes, like all electric equipment – and they even make putting out fires a bit tricky for firefighters, who first have to make sure the array they aim to douse is not powered. Wirth also explains that solar panels generate far more power than is needed for their construction – “at least ten times more” in Germany, in fact, and that number is twice as high in the sunniest regions on Earth with double the sunlight. 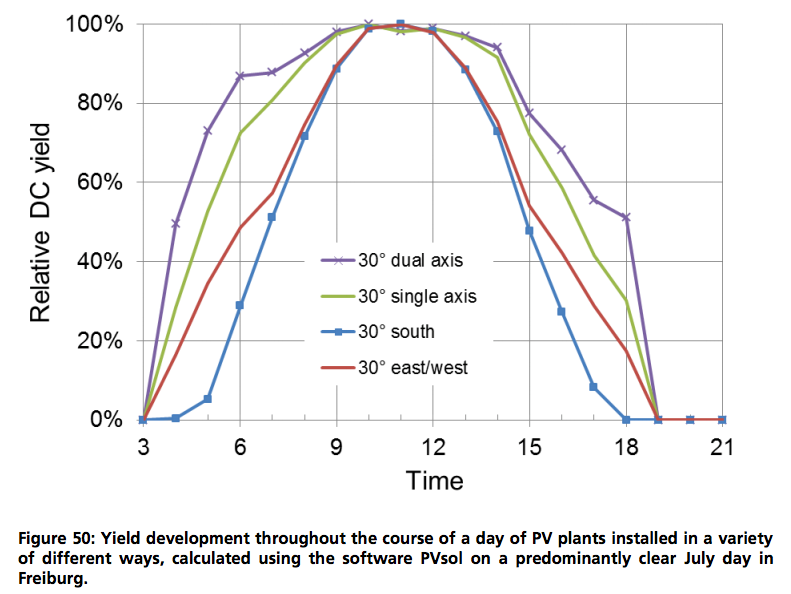 The chart below shows another interesting aspect: the orientation of PV arrays helps spread solar power production across more hours. If you put your array on a stand, you can track the sun with them; the stand turns so that the sun is always optimally faced. If your panels are fixed roof attachments, however, you have no choice; the roof simply faces a certain direction. But then, roofs across the country face various directions, so the cumulative result is similar nationwide: some panels face east and west, not just south. Normally, solar panels would be installed to face due south at a 30° angle in Germany. As the blue line shows, significant amounts of power are then generated for around twelve hours a day in July. But other options increase the daily output duration by several hours a day. There are two types of tracking systems: dual-axis and single axis. The latter simply tilt the angle seasonally. The second axis not only tilts the panels back and forth over the year, but also left and right every day to follow the sun. The result is significantly greater overall power production of up to 30% daily, with most of the gains coming not in the form of a higher peak at midday, bit bigger chunks before and after noontime. Why don’t all arrays on stands track the sun? The extra power produced may not cover the cost of the tracking system, which can also break down. Solar arrays without tracking have no moving parts. Researchers have long proposed a greater range of orientations to spread national solar power generation across more hours of the day. If your roof faces east and west instead of north and south, you have little choice anyway; your panels will produce power for more hours of the day, but with a lower peak in the middle. In fact, an east/west orientation (without tracking) generally reduces overall power generation by at least ten percent. And that’s what’s a bit misleading (for laypeople) about Wirth’s chart above: it does not show any loss in peak production for the east/west orientation. For the tracking system, I wouldn’t expect any, but what Wirth is showing here is “relative DC yield”; in other words, the peak is 100% for all systems. The chart does not show the actual amount of power generated, but simply the temporal “shape” of generation. “The yield profiles are standardized to their maximum daily output,” Wirth told me for this report. So in reality, the east/west orientation would generate more power in the morning and evening, but less at midday than the south-facing array would. As you can see, not all of the charts are self-explanatory, but dive in for yourself and use our comment section below to let us know what other goodies you find! No link given to the Fraunhofer ISE study. It’s here (link). 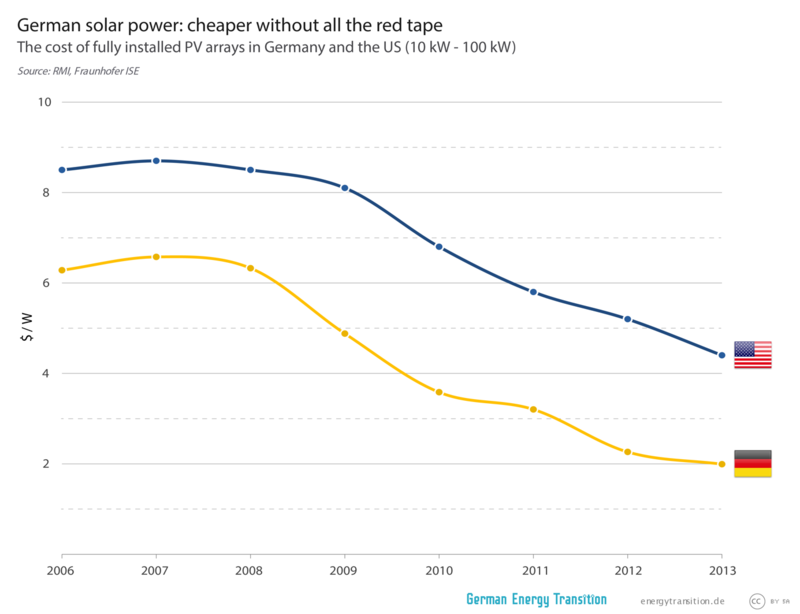 “We show how much cheaper German feed-in tariffs made PV relative to US prices.” The FITs can claim some of the credit, sure, but by no means all. It was the whole system what dunnit. 1. The EEG created a right to sell home-generated solar, with a corresponding duty on the distribution company to buy. 2. There is also – I don’t know whether it’s under the EEG or other legislation – a streamlined, uniform and national process for registering and inspecting home solar installations. 3. No prior permitting is required for small, standard residential installations. This may depend on accreditation of installers, I’m not sure. If there is accreditation, it lowers the risk to customers f being ripped of by cowboy operators. 4. German households have much higher net liquid savings than American ones. A typical German household can pay €5,000 for a small rooftop installation without going to the bank. Finance of such sums is a hurdle to middle-class American households, leading to high-cost exotica like tax equity financing and leasing. All these could be done with a different pricing mechanism than the 20-year FIT guarantee, such as a variable VOST. Another reason (I have heard): it doesn’t optimize power produced per unit area of terrain.